Shape the Battle to your Will! You combine a talent for magic with a study of the art of war. 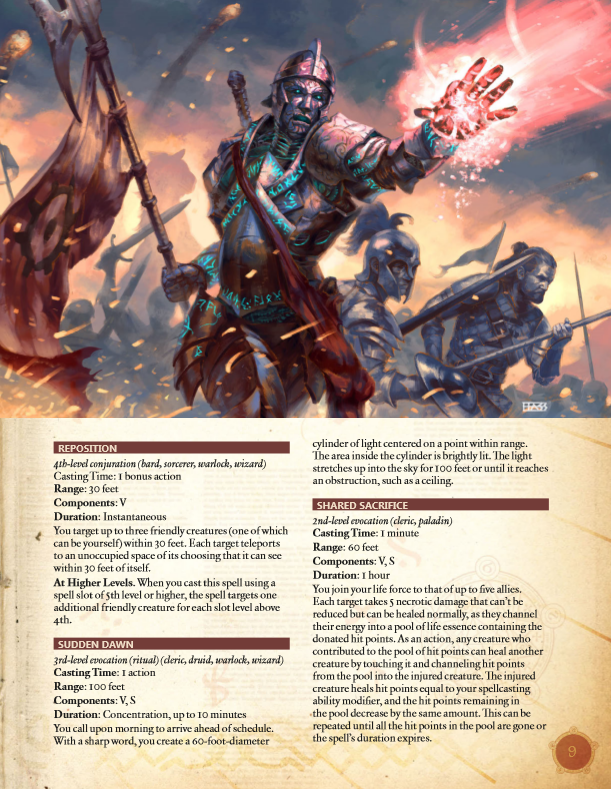 As a battle mage, you know that fire and lightning can decimate an enemy’s forces; but a well-placed defense, the quick movement of allies, and a curse that crushes the enemy’s will to fight can be even more devastating. Battle magic is not just about killing your enemy: your true power is in controlling the flow of combat. The introduction – which must have been written by a mage! – makes great claims for the use of battlefield magic, giving it the pivotal importance that most would attribute to a mastery of strategy and tactics. A good strategist in a world with magic is going to use it to as good effect as he does every other weapon and tactic in his arsenal. However, the good point is made that effective battle magic is a lot more than raining down arcane destruction on the foe. Craft and guile, augmentation of defences through magic and more, also have their part to play. There are also twenty-five new spells at various levels. What’s not to like about being able to conjure up some boiling oil? Although it would be even neater if you could create it above the enemy rather than as a pool on the ground in front of them. Maybe you’d rather curse the enemy with incompetence or magically hobble their mounts mid-brawl. You could cause an eathquake with fault line, or create instant fortifications (or siege engines)… there’s a lot to play with here. You can even reposition yourself and allies via a limited form of teleportation, or create a walking wall of swinging axe blades that moves at your direction. Most of these spells and feats are aimed at the battlefield proper rather than small-scale skirmishes, but if you engage in combat at anything more than your party against the next bunch of monsters or the Big Bad Guy’s bodyguards there’s probably something here worthy of consideration. Perhaps a little specialised but plenty of scope given the right circumstances. 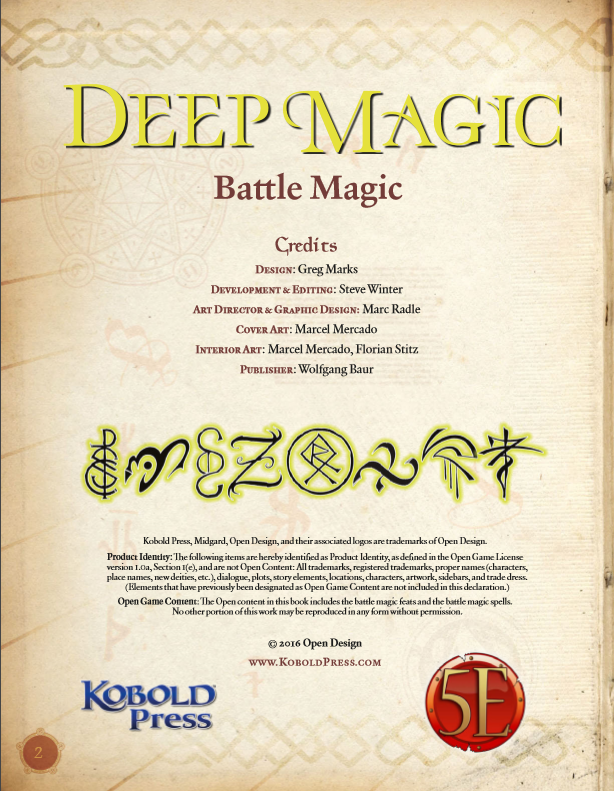 This installment of Kobold Press‘ 5e-Deep Magic-series clocks in at 12 pages, 1 page front cover, 1 page editorial, 1 page SRD, 1 page advertisement, leaving us with 8 pages of content, so let’s take a look! We begin this installment with a brief introduction and then move on to no less than 8 (!!) feats, so what do they do? Arcane Charger lets you Dash and cast a cantrip with a range of touch as a bonus action, granting you +5 to spell damage or the option to push the target 10 feet away if you move at least 10 ft. in a straight line. Okay, so I *assume*, due to the name, that the cantrip is cast at the end of the movement of Dash, right? Or could I Dash part an enemy, cantrip-push him and then move on? I am not 100% clear on the sequence here. I am also not happy with the fact that the push, RAW, happens automatically. Compared to the tempest domain’s thunderbolt strike, for example, which requires actually dealing damage, this is odd. Arms Booster lets you touch an ally’s weapon as an action, which is then treated as magic and gets a +1 damage roll – but the use of this feat requires expenditure of a spell of 1st level or higher as well as completing a short or long rest to use again…and it needs concentration, which hobbles the caster for a pretty minor buff. Beyond that, the feat is called lower caps arcane infusion in the final sentence, which makes me think that something has probably gone wrong in the WIP-stage here. Battlecaster nets you a proficiency with a simple or martial weapon, allows you to use the weapon as spellcasting focus, and lets you add the weapon’s bonus to hit and damage to a spell while wielding a weapon you’re proficient with. Nice one! Eldritch Lifesaver lets you, as a bonus action, expend a spell of 1st level or higher, healing spell level hit points of an ally within 30 ft. or yourself, while also netting you temporary hit points equal to your spellcasting modifier. Thankfully requires a short or long rest to recharge. Elemental Trapper makes you choose one of the 5 elemental damage types, leaving a cloud of this energy behind when casting a spell. Single target spells create 5-foot-clouds in the target’s square. The cloud inflicts spellcasting ability modifier + the spell’s level damage of the type associated with the cloud. Interesting soft crowd control – and yep, the cloud only lasts briefly and damages targets that end their turn in it, so it is kinda fair. Inspirational Caster nets proficiency in Intimidation or Persuasion and when affecting allies with a spell that does not cause damage, said allies get advantage on saves versus effects that “cause charm or fear” for Charisma modifier rounds – so, does this mean inflicting the charmed and frightened conditions? Or does this refer to specific spells? Also: Shouldn’t be cantrips exempt here? Merciful Caster allows the character to knock creatures out with spells, but oddly requires a long rest to use again. Resolute Caster, finally, is imho pretty problematic, as it makes an incision into a pretty basic concept of 5e, namely concentration: After losing concentration, the effect remains in place until the start of your next turn. Sure, feats are valuable, but this carries a whole lot of potential baggage and could use a bit more information. The pdf also contains a total of 25 spells, noting the appropriate classes for the respective spell in brackets after the spell-level. We begin with 3 first-level spells: Adjust Positioning allows you to move one ally nearby 5 feet, with higher spell levels yielding more allies – nice chessmaster-style option that yes, does get opportunity attack interaction right. Hobble mount is pretty self-explanatory – it inflicts damage to the target when it’s moving more than half base speed, with higher level spell slots increasing the damage output. The damage, +2d6 per spell slot level, is pretty potent, considering that the spell does not allow for a saving throw. Cool, on the other hand – both it and spur mount, which nets the mount Dash or Disengage as a bonus action, can only affect mounts. Two minor aesthetic gripes: the range “touch” should be capitalized (It’s not the only such instance herein) and in a weird choice for a pdf, artwork from the next page bleeds over to this one – understandable, considering the likelihood of compilation at one point, but some people may be bothered. This, however, will not influence my verdict. The spell level that gets the most new options would be 2nd, with 7 new spells: Boiling oil creates a 30-ft.-diameter pool that causes fire damage and automatically renders a target beginning or ending his turn in the area prone. And yes, damage applies for beginning AND end -and at 3d8 damage per instance, it is better in every conceivable way than e.g. cloud of daggers, making the spell pretty much OP, even before the no-save prone – grease allows for a save! Mass blade ward, affecting up to 3 targets that may not move further than 30 ft. away, makes for a potent defensive option, thankfully held in check by the brief duration. Poisoned volley is pretty much like boiling oil, but instead inflicts poison damage and the poisoned condition – though with a Constitution saving throw to halve…but it does affect a 20-ft.-square. So yeah, complaint remains, if to a lesser extent. Shared sacrifice allows you to link your life force to up to 5 allies, who take 5 necrotic damage that can’t be reduced – okay, what about immunity and negating the damage? Anyways, these hit points are pooled. Each creature thus linked can, as an action, touch another creature that was affected by the spell, healing hit points equal to your spellcasting modifier, reducing the pool by the same amount. Interesting! Trench does what it says on the tin – it digs a trench. Nice. Warning shot does not specify as what reaction it can be cast, making it non-functional RAW. Wresting wind catapults all items held within 20 ft. of you 10 ft. away from the creatures affected. The area affected is 20 ft. within the designated range. 3rd level yields 6 spells: Curse of incompetence is interesting, imposing disadvantage on the mental ability score checks made to direct a battle and similar commanding features, including penalizing those that seek to make heads or tails of it. Like this one! Mass hobble mount is weird, in that it actually codifies what it affects, specifying beasts, including two-legged beasts ridden Nightfall creates a 60-ft. cylinder of darkness, with sudden dawn doing the opposite. Outflanking boon creates an illusion that helps grant allies advantage on melee attacks versus the foe, with subsequent saves to end it. Weird: “action” is capitalized in the casting time-section. Thunderous wave is a blast that explodes and repositions targets – rather nice…though being pushed even on a successful save can be pretty nasty. 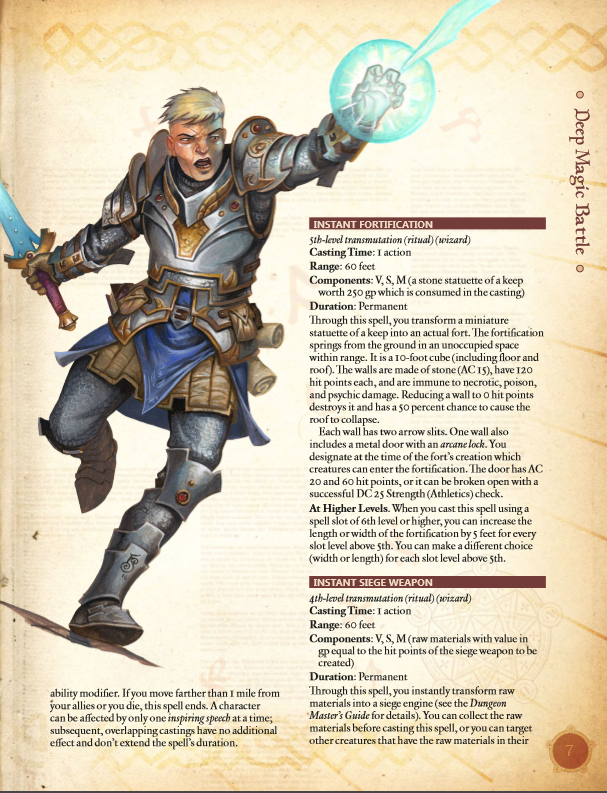 We get 3 new 4th level spells: By the light of the watchful moon illuminates all threats within 90 ft. hostile creatures, traps, hazards – while it’s nice that the spell gets interaction with entering creatures right and does allow for a save, it is anathema to spirits, haunt-like terrain features, etc. – not a fan. 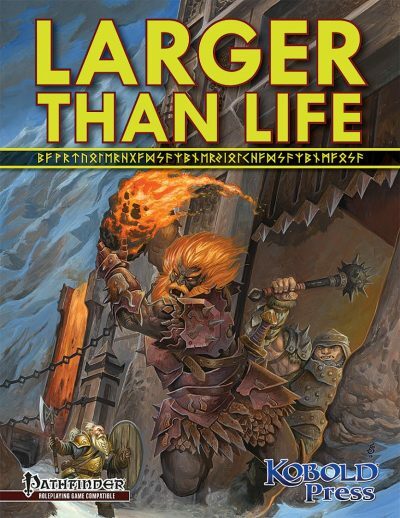 Inspiring speech takes 10 minutes to cast and affects all allies within 60 ft., granting +1 to atk and advantage on saves versus “charm and fear effects” – thing is, there RAW are no such things in 5e. None of the features that cause the charmed or frightened conditions are classified as such. Each ally also gets a couple of temporary hit points – and no, you may not benefit from more than one such effect. Instant siege weapon is easily one of the most interesting spells in the book, assembling a siege weapon instantly if the materials are available, with higher levels providing bigger siege engines. Reposition can target multiple allies and teleport them within 30 ft. –as a bonus action quite potent and nice. Editing and formatting are neither on a formal level, nor on a rules-language level as precise as I’ve come to expect from Kobold Press. 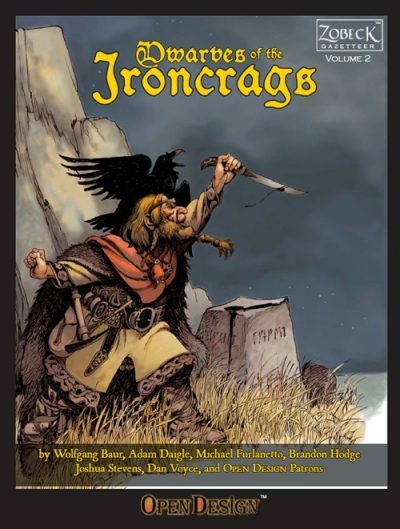 Layout adheres to a gorgeous 2-column full-color standard and the pdf comes with really amazing full-color artworks. 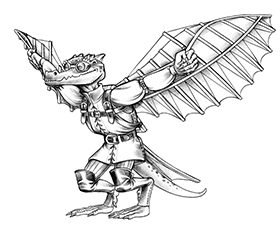 The pdf sports basic bookmarks for the chapter-headers, but not for individual spells. 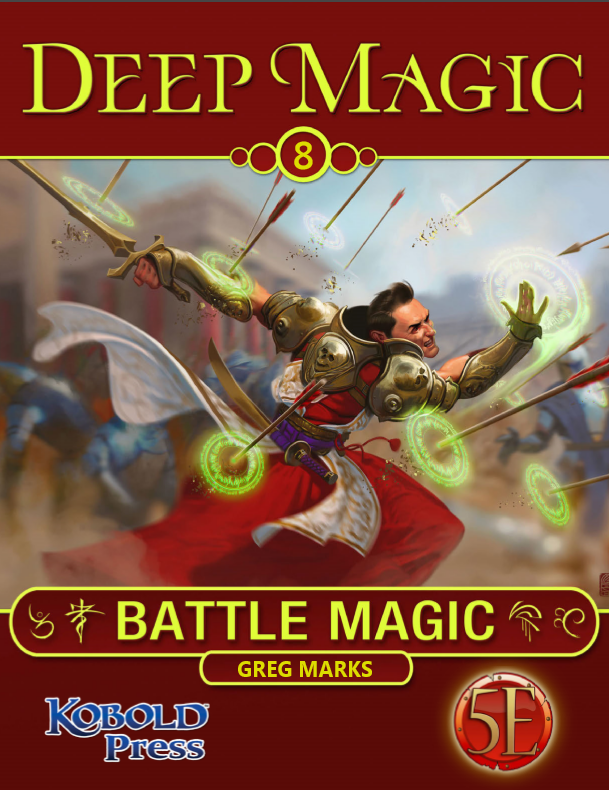 Greg Marks’s battle magic feels significantly less polished than what I am accustomed to see from the series; from balance-concerns to cosmetic hiccups to glitches, we have quite a bunch of problems here; these are partially offset by the cool tricks that *are* in this book, but ultimately, this, to me, represents the low point of the series so far. With a bit of fine-tuning, this can be made to shine, but as presented, I can’t recommend it as anything more than a somewhat mixed bag. As a person, I did not get much from it and my balance-concerns weigh heavily; as a person, I will round down from my final verdict of 2.5 stars. As a reviewer, I do have an in dubio pro reo policy, however, and hence will round up for my official verdict.